From the Washington Post, May 16, 1976: In a large quiet room at the end of a long hallway in New York City a man sits absolutely still behind a round polished wooden table. He is wearing a dark, pinstriped suit, like a banker, a sphinx-like figure of great and somber dignity. More than dignity a feeling of serenity flows from him, a small, quiet Buddha. He is Richard Rodgers, the man who practically invented American musical theater..
His suite of offices, with an enormous Toulouse-Lautrec Jane Avril poster facing the elevator, is in the same Madison Avenue office building as the New York Jets and the Garden Club of America, and he is as much of an institution, if not more so, than either one. By the time that article appeared, Rodgers had been a solo act for 16 years, since the death of Oscar Hammerstein in August of 1960. He continued to write at a fairly impressive clip, from the TV documentary score for WINSTON CHURCHILL: THE VALIANT YEARS and extra songs for the movie remake of STATE FAIR and the film version of ThE SOUND OF MUSIC, to Broadway and TV scores written with himself (NO STRINGS, ANDROCLES AND THE LION), Stephen Sondheim (DO I HEARAWALTZ? ), Martin Chamin (TWO BY TWO) and Sheldon Harnick (REX). In 1962 he took on the role of president and producing director of a new entity, the Music Theatre of Lincoln Center at the New York State Theatre, presiding over a series of opulently-mounted revivals several of which were from his own canon. In addition, the fruitful legacy of his forty respective years with Hart and Hammerstein continued to bloom: young Rodgers and Hart shows from the 20s and 30s, and vintage Rodgers and Hammerstein musicals from the 40s and 5Os, were revived with increasing frequency. In the midst of it all, the business of Rodgers & Hammerstein continued to be the business of Richard Rodgers. In the fall of 1961, while writing a profile of Rodgers for the New Yorker, Winthrop Sargeant visited the R&H office at 488 Madison Avenue. The place contains a large library of scores, Sargeant wrote, a secretary, nine or ten office workers, a grand piano, and a reception room for the constant stream of visitors who want to see the great man for one reason or another...The visitors actors, singers, conductors, publicity men, gossip columnists, and so on sit patiently, happily discussing theatre news (sometimes for an hour at a stretch) until he is free to see them. The spectacle is a little like a levee held in the palace of some old-time European aristocrat. Or, as Rodgers himself put it: The place makes me feel like a nose-and-throat specialist. From its inception, the R&H office had never ceased to evolve. An early mandate to produce the works of others starting with John van Drutens play I REMEMBER MAMA in October of 1944 soon widened to include the teams own works, beginning with SOUTH PACIFIC in 1949. By the early 1950s, R&H decided to change course once again. After BURNING BRIGHT (1950), a John Steinbeck play that lasted on Broadway for only 13 performances and lost its entire $65,000 investment, R&H decided to pull out of the business of producing for others. As sole owners and publishers of their own work, R&H were also the first to see the gold glistening in their musicals stock and amateur potential. 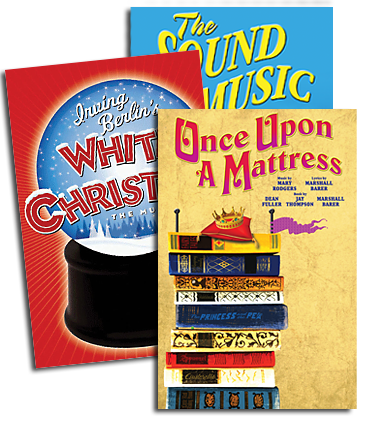 As soon as was decently possible, after Broadway and initial road tours had laid the groundwork, R&H began licensing their properties to the summer stock and now-vanished summer tent circuit, as well as to schools, community groups, and summer camps. What Gilbert & Sullivan chestnuts and American operetta staples were to the pre-WWJJ era, the R&H musicals were to become for the 50s, 60s and (happily) every decade since. Though there were several respectable licensing houses eager and available to handle the ever-growing R&H catalogue, the duo did not hesitate to keep this latest adjunct of their portfolio where they kept everything else: in-house. Thus was born the R&H Theatre Library. 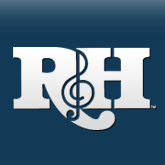 Around the same time, the R&H Concert Library was born too, as the office found itself responding to more and more requests for R&H compositions from pops orchestras and symphonies. With a keen understanding of the marketplace, Rodgers relied on his trustworthy orchestrator Robert Russell Bennett to devise new arrangements of the R&H standards suitable to symphonic orchestras. Starting with the first such pops concert, at Lewisohn Stadium in New York in 1948, many of these R&H-themed evenings were conducted by the composer himself. In the stage licensing area, Rodgers oversaw the initial preparation of materials from the Broadway pit to the high school auditorium. In a 1955 book on R&H, Deems Taylor reported: One project that [Rodgers] is directing at the present is the formation of a complete library of the scripts and orchestrations of the Rodgers and Hart shows, the Rodgers and Hammerstein shows [and Hammersteins SHOW BOAT and CARMEN JONES.] This is easier said than done, for the material for some of the older shows has been so long forgotten that it has simply disappeared; and digging it up necessitates a wearisome amount of research. Rodgers brought a clear-eyed analysis to the evaluation of his early works with Hart, in some cases making the decision (bold for his day) to have scripts revised if he felt the need. George Oppenheimers version of BABES IN ARMS was first licensed in 1959; an alternate script for I MARRIED AN ANGEL by Lois Jacoby was unveiled in summer stock in 1964; and a revamped BY JUPITER, with additional material by Fred Ebb, made its way into the R&H catalogue after an Off- Broadway stint in 1967. Having outgrown the 488 Madison Avenue offices, R&H moved to 598 Madison in the early 1960s. (Legend has it that Rodgers himself selected the new offices phone number, which played the tune for Doe a deer, a female deer when the appropriate push-tone keys were pressed.) The Theatre Librarys shipping and storage concerns, originally housed within the office, outgrew their original quarters and were relocated to their own space on West 52nd Street in Manhattan, before transferring to a warehouse in Long Island City. Along with real estate expansion, the roster of writers, shows, and concert works was expanding too. R&H had refocused once again, transformed from a producing engine to a licensing conglomerate. As sole surviving co-founder and chief proprietor of the firm, Rodgers welcomed in Hammersteins eldest son William, who was steeped in the theatrical profession that marked three generations of Hammerstein's before him. However, even with experienced hands like Bill Hammerstein and longtime associates Morris Jacobs, John Fearnley and Jerry Whyte heading the team, there was no doubt where the buck stopped. Who makes all the decisions around here? Me!, Rodgers once groused. I wish to God that just once somebody would turn up who wanted to do something for me, instead of wanting me to do something for him. There were people who wanted to do something for Rodgers; they wanted to honor him for his lifetime achievements, to celebrate his glorious career. Rodgers the composer kept looking forward, trying to keep up with trends he himself had started, but Rodgers the entrepreneur knew that good PR was good business; as the years rolled by, he therefore accepted one shiny accolade after another, always willing to bask in the glow of earlier eras if it helped the cause. CBS saluted him with an all-star Ed Sullivan-hosted extravaganza in 1962; ABC offered RODGERS AND HART TODAY in 1967 (with the likes of Bobby Darin, The Mamas and the Papas, and The Supremes); and CBS returned with a Bicentennial special, AMERICA SALUTES RICHARD RODGERS, in 1976 with Gene Kelly playing Hammerstein, Henry Winkler as Larry Hart, and John Wayne introducing a patriotic tribute to Victory at Sea. In 1978, Rodgers was among the first five recipients of the Kennedy Center Honors. At the 1979 Tony Awards, in a move masterminded by the wily impresario Alexander H. Cohen (producer of both the Tony Awards and Rodgers latest Broadway offering, the musical version of I REMEMBER MAMA), a special tribute to Rodgers opened with Manhattan (his first hit, written in 1925) and ended with an unmistakable plug for MAMA. however, the R&H office kept going. In early 1980, it was announced that Richard Lewine a longtime friend and associate of both Rodgers and Hammersteins would take over the management of the business. Its important that someone with a full appreciation of the artistry of Rodgers and Hammerstein oversees the licensing of their work, Lewine told the New York limes, adding, Ive agreed to supervise all the enterprises owned by the estates for two years. In May of 1981, the Rodgers and Hammerstein families brought in a young man to be groomed as Lewines successor. His name was Ted Chapin. A slightly bemused journalist for the London Independent wrote recently, Irrational as the response may be, it still feels slightly eerie to dial an office number in midtown Manhattan and hear the receptionist politely identify herself as Rodgers and Hammerstein. With a staying power virtually unmatched in the theatrical industry R&H is still here its offices grown from two employees to more than forty, its real estate morphed from a few rooms in the RKO Building sixty years ago, to two midtown Manhattan commercial spaces today. No longer a producing entity The Rodgers & Hammerstein Organization (that official Organization suffix not formally applied until 1992) has emerged as a proactive rights-holding agency, representing dozens of writers and musicals, encompassing the past, present and future and all the while holding to the mantra of our founders: nurture the writer, and protect the copyright. Ted Chapin has served R&H for over 20 years; his bosses (as he calls them) were, originally, Dorothy Rodgers and William Hammerstein, eventually succeeded by Mary Rodgers and James Hammerstein. Today, Oscar Hammersteins daughter, Alice Hammerstein Mathias, has joined the family management team. What I find remarkable, says Chapin, is that, after all these years, this is still a thriving family business, and all the more unique because it is perhaps the only 50/50 working partnership that has continued to thrive for sixty years...All decisions are based on a combination of historical tradition, knowledge of the world we live in today, and pure instinct. Rodgers and Hammerstein thought outside the box, so we try to do that too, Chapin observes. They took risks, so we take risks. Our goal is to build on the incredible legacy of these two extraordinary men.